I hope I am wrong, but I suspect the bucking problem may persist until you get down to 2 - 2.5% grade. A person of your ingenuity may be able to come up with a car that has working brakes/resistance to apply needed drag to the downhill runs. 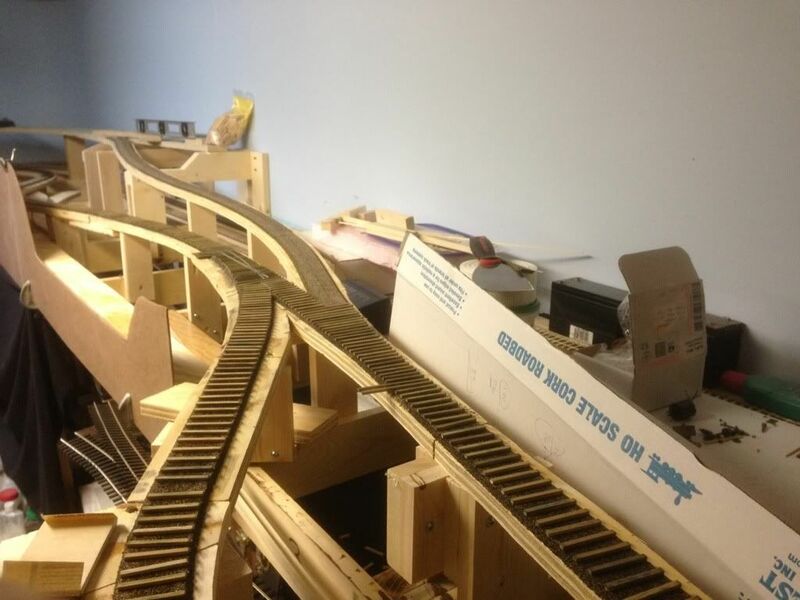 I put down some flex track on the mainline hill to see how a train will react on that grade. My Kemtron shay went down hill nicely as expected and the Bachmann Climax when down good as long as I kept the speed down so the loaded hopper cars kept weight on the drivers. The Bachmann shay is a different story, there is just too much play in the entire drive, from the bevel gears on the wheels to the line shafts, and then into the gear box where they have a half dozen small gears. The up hill test was a different story. My test train was 8 empty hoppers and a caboose, which is the maximum train allowed. The Climax walked right up the hill just fine. The Bachmann shay slipped the drivers, which I believe is because my brass boiler is not as heavy as the diecast boiler on the Climax. The disappointment was my Kemtron Shay, it lost gear mesh halfway up the hill. 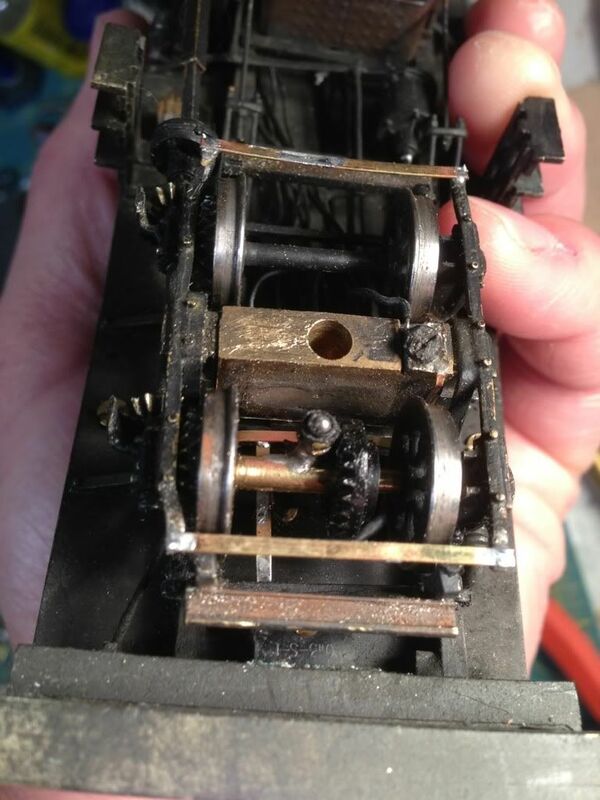 I am going to have to look into the gears to see what is going on, I have heard that under stress the plastic crossbox bends and the gears will lose mesh, if that is the case I will scratch build a brass crossbox. SO far I like the challenge of the hill and I really like the look, I also think that it is one of the signature elements that show why gear locomotives were used in that service, so I am going to stick with it and figure out ways around the issues. I took this photo on the LS&I in the late 80s and my grade reminds me of this location. I had an idea, because my closet came out 6" farther than I planned I could not make the turn to cross in front of the closet for a future expansion, I guess I will have to figure that out if and when the day ever comes, but I was able to tack on an extension to the bench work and add this short siding, what I will use it for I have no clue, but it is there. I placed some sections of old road bed on the layout to plan out the route for Slater Creek (the water way, not the railroad). I decided that it would be interesting to make Slater Creek go between the new siding and the mainline, then cross under the siding. the more I have been thinking about the photo that shows the shay with two hopper cars on the main with the hole in the backdrop the more I think I will have to get really creative to hide the hole in the back drop yet have a small stream look like it goes on into the backdrop. I think I can do it but it is going to take some trickery for sure. Rather than try to continue your creek into the backdrop which I think will never give you satisfaction with your very exacting standards. May I suggest that it just hooks sharply and disappear behind a rock outcropping or a steep hill. Or, it could disappear into an aqueduct type bridge underneath the new siding. As for the hole in the wall which the shay and two hoppers are headed.. maybe that area could be heavily forested. been working on my Kemtron shay gear box and my Heisler gear box, trying to get them to perform going down the 5% grade. 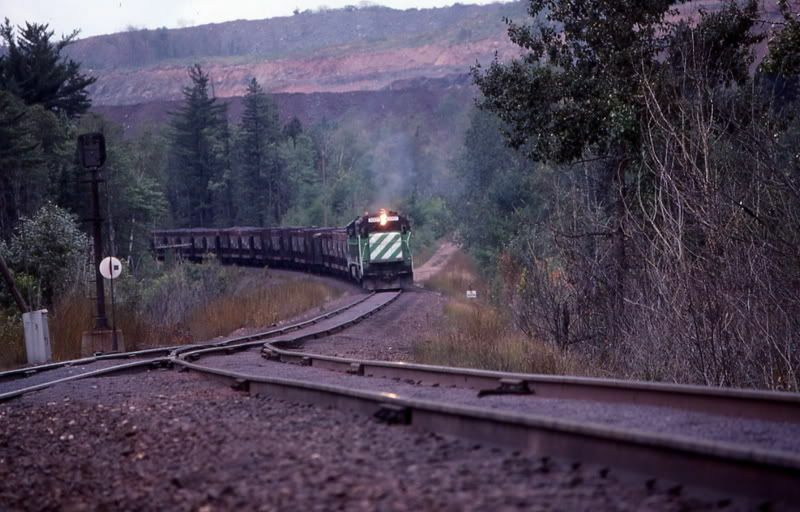 I have thought about lowering the grades but I really want to have the steep grades because it is a defining feature of a geared locomotive line. The Kemtron shay is going great down grade but it keeps slipping the gears going up. The original cross box from Grandt Line had too much play in it, I made a new one from brass and I pined the bottom collar in place because the force of the gears on the grade backed the collar off and then it really slipped the gears, not I have it better but it is still slipping. I think the cross box is an interesting idea but it is a very weak design because the gear shaft is only held on one end and there is a lever effect on the shaft. I am going to design a new cross box that holds both the top and bottom of the shaft. The Heisler is coming along nicely. I got a different driving sprocket, the one I was using was a 6 tooth which made the engine run too slow. I know these engines ran slow but I want them to run slow with low motor RPMs to keep the noise down. I also did not like that the 6 tooth sprocket had a slightly different tooth pitch and it caused a little catch as the chain rolled off the sprocket. The new sprocket is a 9 tooth Grandt Line, with the correct pitch. The chain now runs really smooth. The new sprocket was plastic but the hub has enough material to allow for a nice set screw to hold the sprocket to the motor shaft, a flat spot cut on the motor shaft helps hold the sprocket in place. I got everything running good except the front truck, there is a catch in the gears that I cant seem to solve, I filed out some burrs and I am going to try some lapping compound to see if I can get it out, the back one runs fine. I got the Shay all tuned up and running like a champ. After looking at the new crossbox I made from brass I noticed that the new bevel gear support was not flexing as I first thought, it was actually the slop in the main axle tube. I thought about reducing the diameter of the main axle tube but I was afraid the clearance would be too tight and it would cause too much drag. I decided what I really needed was to support the universal coupling above the bevel. To give support to the universal I came up with a very simple modification, I ran some flat brass across the top of the truck side frames and then a piece of flat brass from the brake hanger to the new piece that connects the side frames. The second piece of brass runs right next to the universal coupling but does not touch it. A small brass bearing plate was soldered on next to the universal with about .005 inches of clearance. When the locomotive is operating on level or moderate grades the universal is running free, when the locomotive encounters a grade or is pulling a heavy load the bevel gear wants to pull away from the ring gear, when it tries to pull away it will run against the new brass stop I made and it will not allow the gears to come out of mess. I will grease up the bearing plate but it probably does not need it because the universal is made of slippery plastic. The entire modification took about 30 minutes but really it took about 20 minutes to think how to do it and 10 minutes to solder on the pieces. here is a bad photo of how I did it. The new brass pieces that support the universal are on top of the truck, the two that you seen spanning the trunk on the bottom by the brake shoes are new parts I replaces because the originals got damaged. the parts I added form what looks like an offset "T", one runs vertical in the photo and the other is horizontal (seen just above the axle). here is a video that shows the results, the locomotive sound decoder is turned off so you can hear how quiet the locomotive is. I also back the locomotive down the 4.8% grade to show that it can run smooth down hill with out bucking. Now that it is all working good I will clean up the truck and touch up the paint job. I decided I am going to lower the mining area so the upper switch back grade will be about 4%, it should make it a little easier to see the tracks when an operator is switching up there and it will be easier on the smaller locomotive stationed up there to do the switching if it runs out on the upper grade. 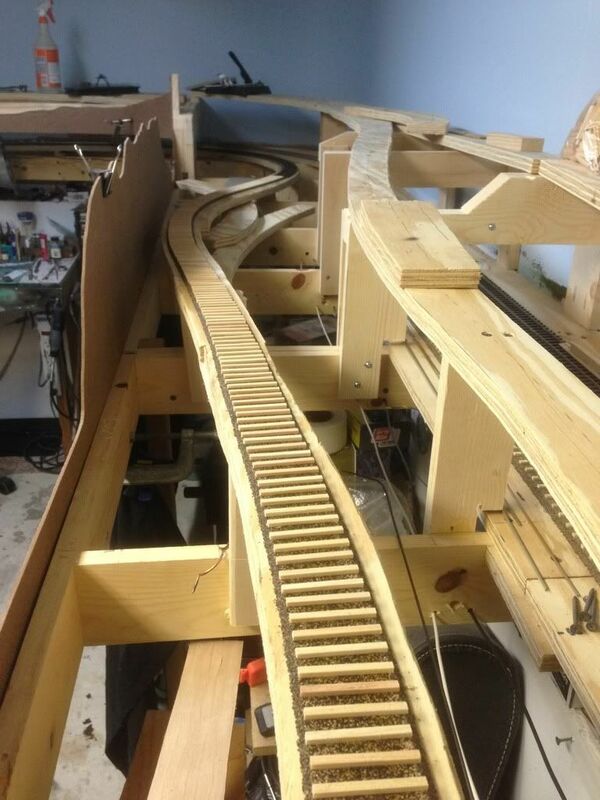 After I get that roadbed lowered I can finish up the lumber work and get some track laid. Looking pretty good. Can't get over how well done that firebox flicking is. 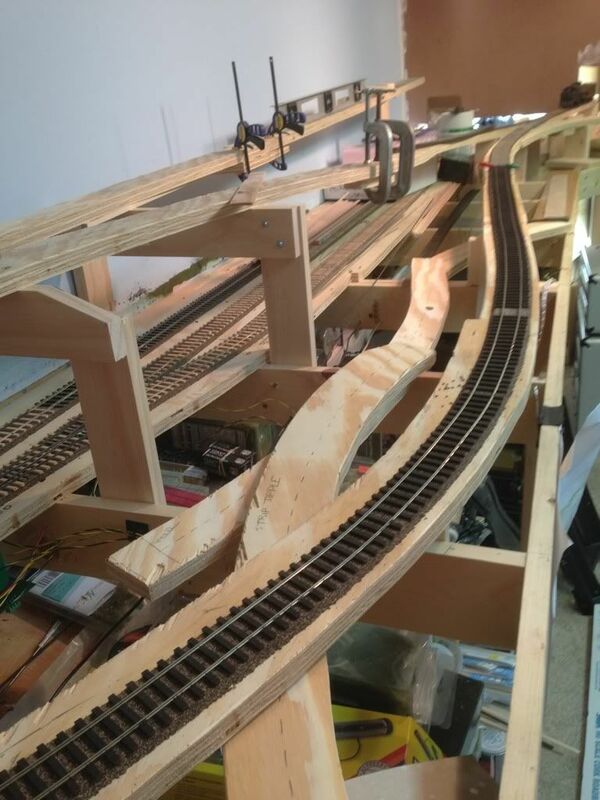 I got to spend some time on the layout over the weekend, which involved laying ties and cutting fascia boards. I had an idea that I might try, although I am not sure I like it or not. 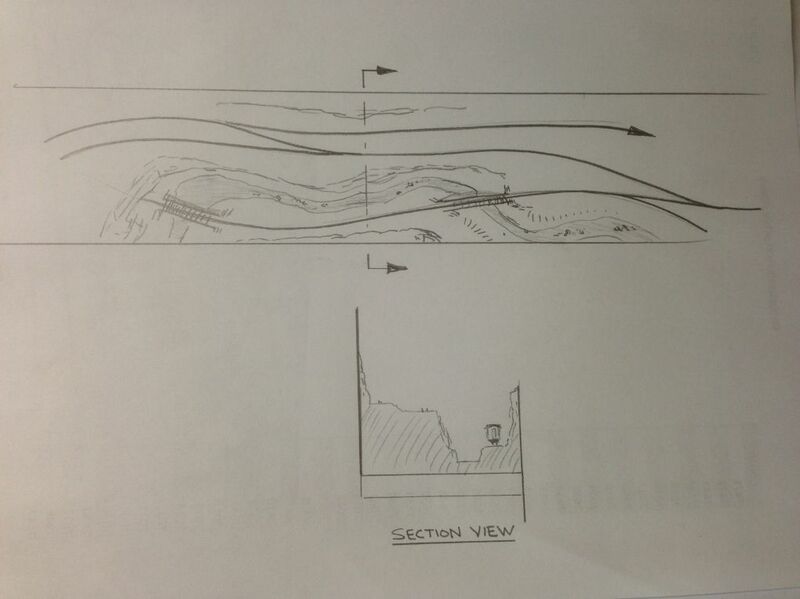 I was thinking of extending the fascia up above the track and build a rock wall, then run Slater Creek down between the lower and upper switchback track as if the tracks are going up one side of Slater Creek for a ways and then switchback up the other side. 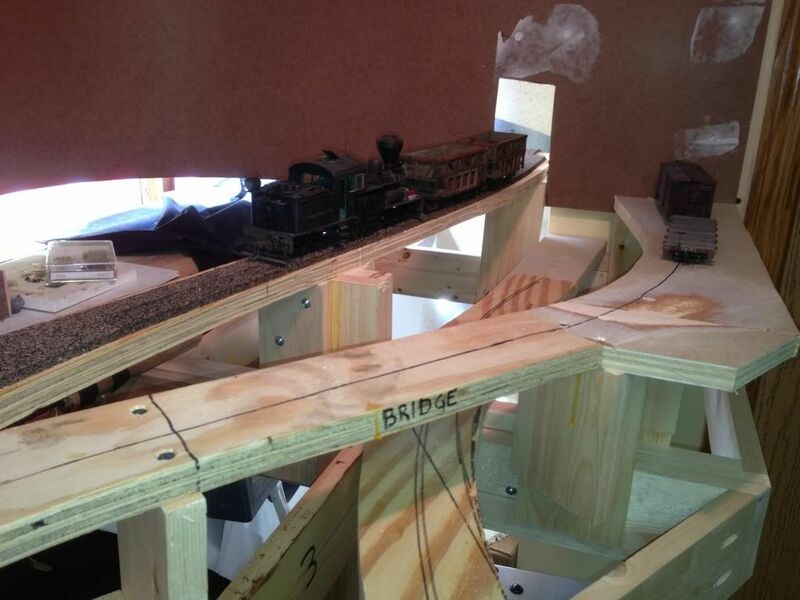 To see the trains on the lower switch back you will have to look down the "canyon". I think it could make for some cool photos but I am worried that it will appear to hide the train a lot. I put the fascia up to see how it will look. I also got a lot of ties down and I gave them the base stain, next I will sand the tops level, distress them, and do a final stain. Make the fascia and corresponding scenery removable, so if you get sick of looking down or just don't like it, you can leave it off and just put it back on for the photos. I like the idea of trains playing peek a boo in and out of a canyon up front. It would surely make for some good photos as well as an interesting visual as it ran along during ops. By cutting down the height of your facia to 1/3 to 1/2 as much as you have in front of the tracks, you could get the same "suggestion" of the canyon wall, that you are trying for, with out hiding the train so much. I assume you will have some trees or scrub brush or what have you, that will extend the sense of the hard scenery upward as well. They will be some what transperent with your train being seen and not being seen behind them, which will add to the effect, that I think you are after. Any way cool idea! Paul Scoles has done this to some great effect on his Layout. Remember that scenery while being realistic, can also be suggestive. In theatrical or film/TV set design, we call this suggesting the 4th wall. I've been following your thread for some time, and think your work, ideas for the unloading are great, and inspiring. It's given me some ideas for how to design an old fashioned smaller 1910era hydro electric dam under construction up close to the front edge of the layout. 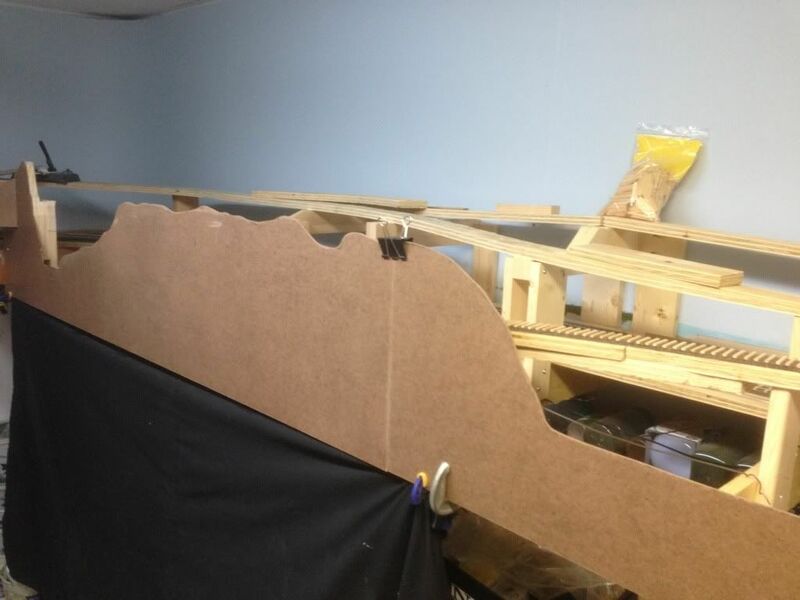 Thanks for the ideas, I wanted to use more of a rock wall between the tracks and aisle because it will be more durable, I am afraid if I do any trees or shrubs they will get broken off from people reaching over to the back track.